Congress does have rules to guide fiscal policy. The 1974 Budget Act specified a set of procedural rules that Congress is supposed to follow each year in passing a budget. However, Congress has passed the full set of appropriations bills on schedule only three times in the past 40 years. Even more problematic is the failure to align annual tax and spending decisions, whether made on time or not, with long-run goals of stability and economic growth. Attempts to address that problem have proved inadequate. Consider the debt ceiling, first enacted more than 100 years ago. Even if we could accurately determine the point beyond which debt becomes excessive, the ceiling in its current form is unworkable. Since it is set in nominal terms, with no allowance for inflation or growth of the economy, Congress must vote periodically to raise it. That creates opportunities for various factions to disrupt the budgeting process with brinkmanship over extraneous issues, even though everyone knows that the consequence of not raising the ceiling — default on the debt — would be so dire as to make the whole process a charade. A more recent type of rule, known as pay-as-you-go, or PAYGO, has fared little better. PAYGO has taken several forms since it was first established in 1990, but the underlying idea is to require that tax cuts or new spending be offset by tax increases or spending cuts elsewhere in the budget. In case the necessary offsets are not made, sequestration — mandatory cuts to already authorized programs — can be invoked to prevent an increase in the deficit. In practice, however, Congress can, and does, waive PAYGO rules whenever it wants to. For example, it used a waiver to allow the 2017 tax cut to go into effect despite the resulting increase in the deficit. If procedural rules are not enough, what would work better? 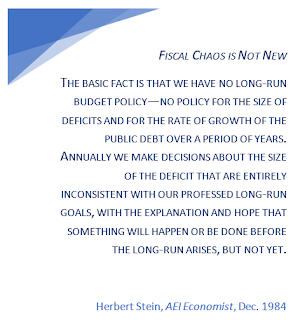 The answer is that if we want a more responsible fiscal policy, we will need to rely less on the short-term impulses of politicians and more on policy rules that target stable, sustainable growth. Here are three suggestions. Rule 1: First, do no harm. The economic equivalent of this maxim is to aim for cyclical neutrality, that is, one that that manages taxes and spending in a way that avoids prolonging expansions or deepening recessions. The “structural” part means that the actual surplus in any year is adjusted to reflect the levels of tax receipts and spending that would prevail, under current law, if the economy were at full employment. During a recession, the actual balance is below the structural balance (that is, further toward deficit) because of low tax revenue and high spending on income transfers. When the economy is running hot, the actual balance is above the structural balance (that is, further toward surplus). The “primary” part of the term means that interest payments on the national debt are disregarded. Although interest payments are a form of government outlay, in the short run, they are not under the control of policymakers. Instead, for any given level of debt, federal interest expenditures are largely determined by market interest rates. The target for the primary structural balance could be set at zero, at a small surplus, or at a moderate deficit. The choice depends in part on variables like the economy’s long-run rate of growth relative to market interest rates, and also on whether policymakers want to hold total debt steady as a share of GDP, to allow it to grow gradually, or to decrease it (for details of the math behind the choice of targets, see this slideshow). Under conditions that currently prevail in the U.S. economy, a zero primary structural balance, or even a small deficit, equal, say, to half a percent of GDP, would be sufficient to achieve cyclical neutrality while ensuring that the debt ratio would gradually decrease. “Do no harm,” of course, is a pretty low bar. In theory, a rule that held the primary structural deficit at the desired level over the business cycle but allowed temporary countercyclical tax and spending measures on a discretionary basis would be even better. However, practical considerations of lags and forecasting errors, not to mention political temptations to do the wrong thing at the wrong time, provide grounds for caution. The PAYGO waiver for the pro-cyclical 2017 tax cut, passed as the economy was well on its way to full employment, is a case in point. However, there is one important exception to the “no exceptions” rule. A “do not harm” rule should allow for extra fiscal stimulus, beyond the amount needed to hold the primary structural balance constant, during periods when interest rates fall to the zero bound, rendering conventional monetary stimulus ineffective. The 2009 American Recovery and Reinvestment Act of 2009 would fit that specification (see here and here for analysis of the ARRA and its effects). Rule 2: Tax and spending reforms should be consistent with macro targets. Fiscal policy has both a macroeconomic and a microeconomic side. Rule 1, which calls for cyclical neutrality, serves the macroeconomic goals of stability and growth. Microeconomic issues concerning the structure of taxes and the composition of spending are also important, but they should be approached in a manner that does no macroeconomic harm. In particular, tax reform, whether aimed at removing perverse incentives or improving distributional equity, should be carried out in a way that is revenue-neutral over the business cycle. For example, cuts in distortionary payroll or corporate-profits taxes could be offset by increases in taxes thought to be less distortionary, such as consumption or carbon taxes. Similarly, spending increases — even putatively growth-enhancing ones such as infrastructure spending — should be accompanied by cuts to lower-priority spending programs or appropriate tax increases. Like its distant cousin PAYGO, this rule would require Congress to consider impacts on the deficit when passing tax or spending legislation. However, it differs from PAYGO in two important ways. First, it would be symmetrical, in that it would not only bar inappropriate fiscal stimulus when the economy is near full employment, but also inappropriate austerity during a recession or the early stages of a recovery. Second, the degree of offset for tax cuts and spending increases would vary with the business cycle. The required offset would be less than 100 percent near the bottom of the cycle and greater than 100 percent at or near the peak. Rule 3: Fiscal rules should be neutral with respect to the size of government. Conservatives often propose that any fiscal rule should place a constraint on the overall size of government. For example, a 2011 version of a balanced budget amendment proposed capping federal expenditures at 18 percent of GDP. Such a constraint would be a mistake. Instead, any rule governing the path of the deficit or surplus over the business cycle should be neutral as to the size of government as well as neutral with regard to the cycle itself. In reality, there is little evidence to support the idea that small government is necessarily good government. On the contrary, as I have discussed previously (see here and here), the available evidence shows a negative correlation between the size of government relative to GDP and broad measures of prosperity, personal freedom, and economic freedom. Overall, quality of government, as measured by such things as the rule of law, protection of property rights, and government integrity, is more important for freedom and prosperity than the size of government. Yet even if one believes a smaller government is better, such rules inject a contentious ideological motive into the debate over how best to reduce the debt level. A rule that is neutral to government size leaves the question up to democratic debate, with the proviso that new structural spending must be paid for. It is not likely that the White House or Congress will agree anytime soon to putting fiscal policy on autopilot, nor should they. Overly rigid rules would do more harm than good if strictly enforced (as a balanced budget amendment would be), or would invite so many waivers as to make them meaningless (as in the case of debt ceilings and PAYGO). Yet between rules that are too rigid and no effective rules at all, there is a golden mean. Those who are in charge of fiscal policy could learn a lot about the proper balance between rules and discretion by heeding the example of the Fed. For years, there have been economists who have urged the Fed to follow a more rules-based policy and others who resisted those urgings. Speaking at a 2017 conference where both sides of the debate were thoroughly aired, Frederic Mishkin, a former member of the Fed’s Board of Governors, argued that rules vs. discretion is not an either-or choice. Instead, Mishkin sees the Fed as moving toward a regime of “constrained discretion” — one that pays attention to rules but permits departures from the rules in response to unexpected economic shocks. He argues that as long as such a regime is backed by transparent communication of policy goals and actions, it can avoid the disadvantages both of pure discretion and of overly rigid rules. In fact, thisstatement on the Board of Governors website amounts to an assertion that constrained discretion is already the Fed’s official policy. Other countries, such as Sweden and Chile, have successfully applied constrained discretion to the management of government deficits and debts over the business cycle. We could do so, too, if we could find the political will. Let’s hope that it does not take another recession or self-inflicted fiscal crisis to provide the impulse.